Parenting - Moral Reconation Therapy - MRT® distributed exclusively by Correctional Counseling, Inc.Moral Reconation Therapy – MRT® distributed exclusively by Correctional Counseling, Inc. Parenting - Moral Reconation Therapy - MRT® distributed exclusively by Correctional Counseling, Inc. 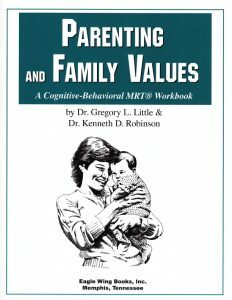 The parenting workbook, Parenting and Family Values, is appropriate for all parents. It is used in many settings, including behavioral health providers, substance use disorder programs, mental health and criminal justice settings. Participants complete homework from the 12-module parenting workbook prior to attending group. During group sessions, participants share their responses. The parenting workbook is designed for 12 group sessions. The workbook can be conducted in an open-ended group format or as a class in which all participants enter and complete at the same time. Moral Reconation Therapy- MRT® training is not required to purchase and use this workbook.